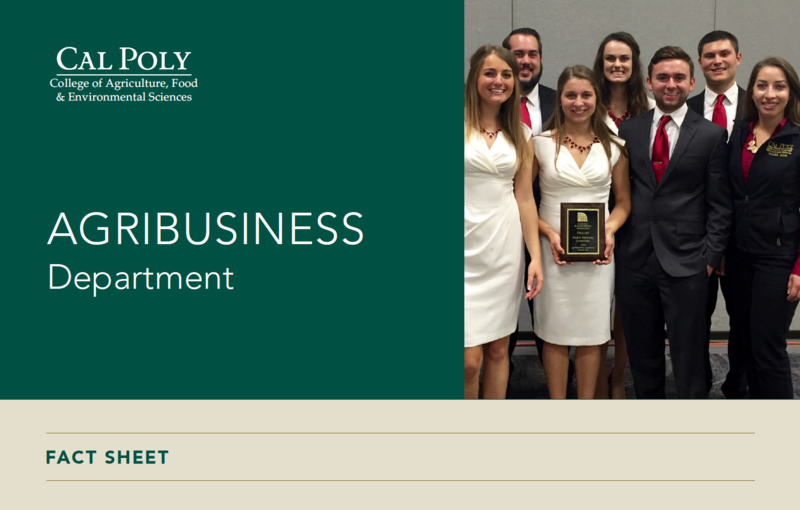 Cal Poly’s Agribusiness Department is well known for producing future agribusiness leaders. Our graduates have a global perspective and are exposed to the world’s dynamic environmental, political, economic and social environments. Upon graduation, students have the requisite interpersonal, communication, critical thinking, problem solving, and applied business skills that are required for successful careers with regional, national and international agribusiness industries and the firms and organizations that support those industries. Our students thrive on hands-on learning in applied economics; agricultural sciences and technology; food, resources, environmental and sustainability issues and policy; accounting; food, fiber, horticultural marketing; finance and management. Agribusiness incorporates the university’s Learn by Doing philosophy by providing classroom projects that emphasize the use of applied economic and business principles. Students gain real-world experiences to address agribusiness opportunities and problems through participation in international experiences, internships, field trips, and club activities. Our students leave Cal Poly ready for to take on the challenges of the professional world of agricultural business. I enjoy the diversity of classes in Agribusiness: from Animal Science and Viticulture to Business Law and Economics. — Sierra Portue, student from Brentwood, Calif.